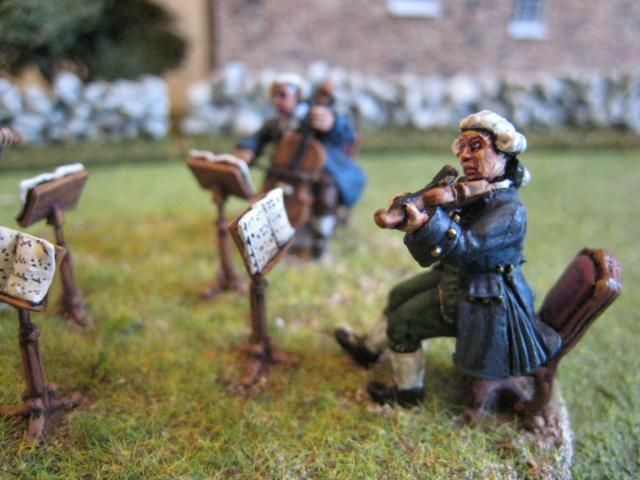 I thought I'd put these figures under the "Civilians" label but this is the first post of 3 on Eureka Miniatures' 18th century musicians and perhaps they deserve a separate label. 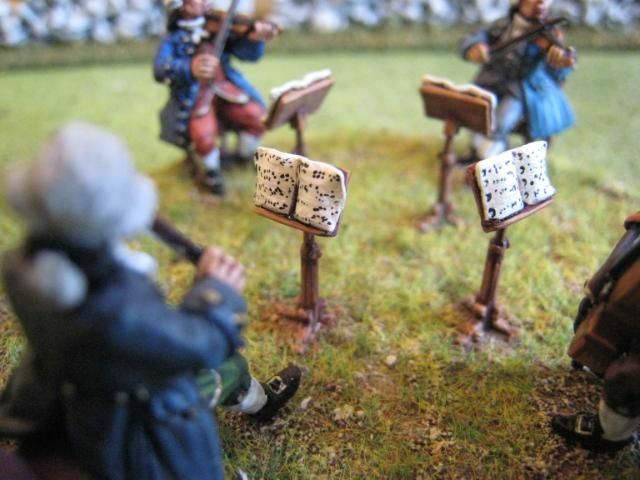 Anyway, Eureka have done a fantastic job in releasing this string quartet and "personality" figures of Frederick the Great playing his flute and CPE Bach playing his keyboard (I've finished Frederick but haven't started Bach yet). 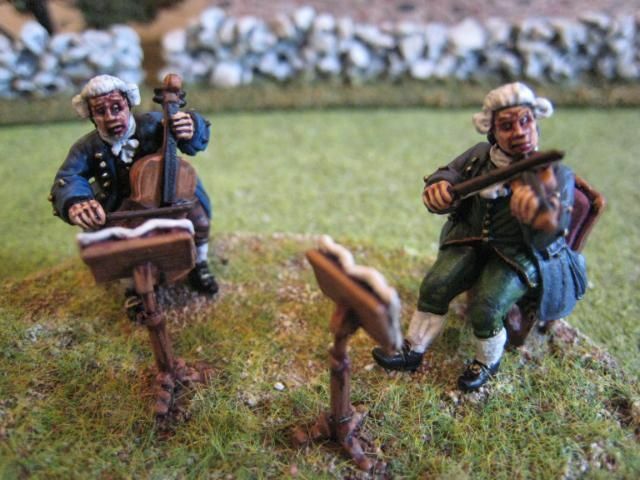 These are all equisite figures and I recommend them to all 18th century gamers - you can never have enough musicians on the tabletop. 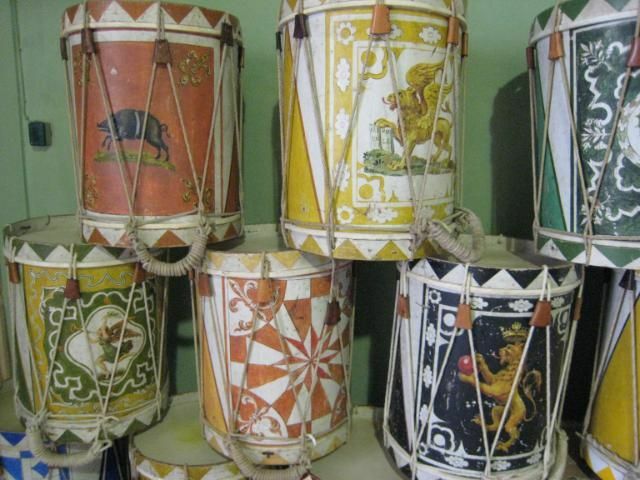 The sculpting of the instruments and the way they are being played is very good. I was delighted to see that the viola (my own instrument) is noticeably a bit larger than the violins and I like the way that the players are leaning forward as they play. My only niggle is the positioning of the heads - only the cellist is actually looking at the music. But I suppose you could think of the others as (quite validly) either looking at their finger-work or at each other; on that basis I tried to position the figures so that they are looking at each other. 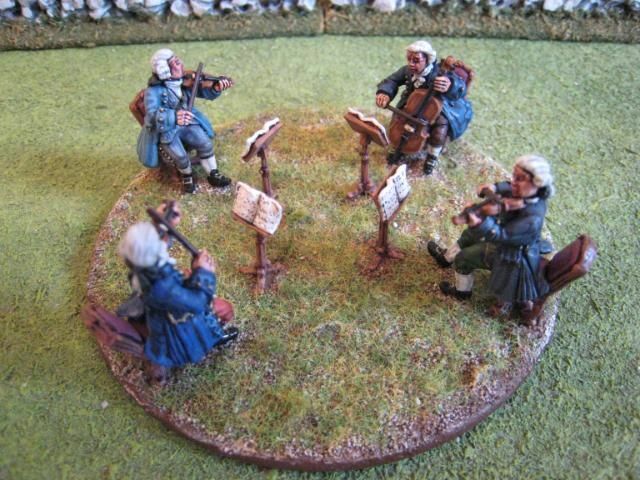 One option with these figures is to paint them all in the same outfits to represent a court or house band. Given that these are for use in 1770s America I decided against the livery look but tried to create some uniformity by giving each player a powdered wig and a blue coat. I wanted to suggest a group of professionals who are wearing their own clothes but are ensuring that they co-ordinate in some fashion. One of the two violin players has a more elaborate coat than the other and so I decided he should be the leading first violin. For the instruments themselves I found that the Foundry "Tan 14" palette was perfect. The seating of the figures is not quite right, which is a bit annoying because I did some research to see whether is was (and is) more common for the viola or cello to sit on the outside. There is no "correct" answer to that point and I put the viola player on the outside. However, in front of an audience the viola is supposed to be opposite the first violin with the other two forming a semi-circle behind them; this is so that none of the players' backs are presented to the audience. With my figures, even though there is a nice symmetry in the way they sit on the base the backs of two of the players will always be towards the audience. I'm not sure how that happened.... and perhaps it would have been better to have based each player separately, but never mind. The quartet is playing the opening of Quintet No.6, Op.57 by Luigi Boccherini (the fifth part is piano). When painting the music I wanted to work from an actual score rather than just make up the annotation, and this was one of the few suitable pieces I could print off online. The quintet was probably composed in 1780 and it has a suitable nickname, "The Military Night Watch in Madrid". Trying to fit a full 10 staves on each page would have been ridiculous, so I settled for 4 staves per page and I did try to ensure that what I painted followed the music and thereby captured the various intruments' roles. So, for example, the music for the first violin is busier than for the other players and the viola player (as usual) has some long rests and a part that is not particularly exciting; hopefully the clefs look a bit different too. These figures are part of Eureka's "100 Club" system, whereby you put your name down for figures in advance of their being sculpted. Consequently I don't think they are on general release just yet. Recordings of suitable period music are easy to find. Some of my favourites are Haydn's Op.17 quartets (1771), Boccherini's Op.19 flute quintets (1774-6) and Antonio Rosetti's Op.6 quartets (1787). 4 figures. Painted June 2010. The whanau and I have just returned from a week in Tuscany. 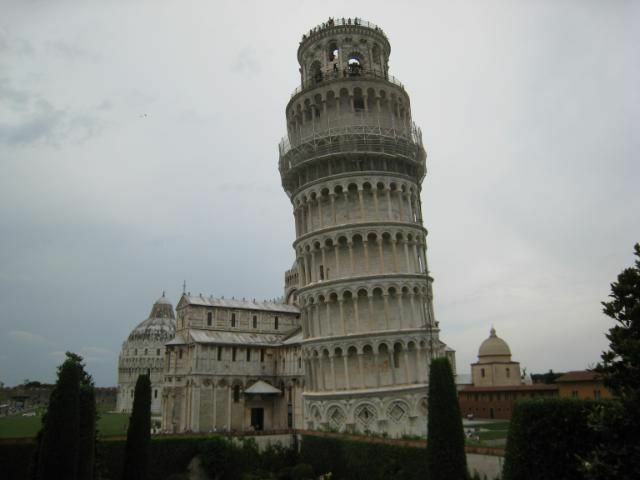 We spent a few days in Pisa and then a few more in a villa outside of the town of Lucca, which we shared with some of the Kiwi's friends. We had some lovely weather but also 3 days of heavy storms, the last of which caused a complete meltdown at Pisa aircraft as too many delayed planes arrived at once, producing scenes of chaos I haven't experienced since Athens airport in the mid-80s. Hugo attracted much attention from the bambino-loving Italians; one lunchtime he was passed around a resturant from one female admirer to another, which he much enjoyed being the awful flirt that he is. 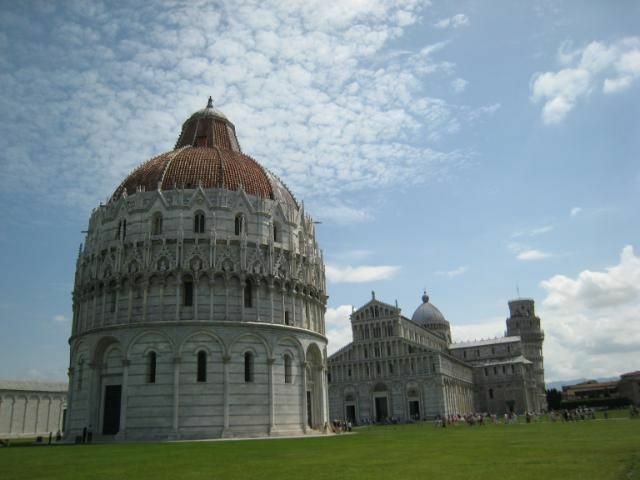 Whilst Lucca is a stunningly beautiful Tuscan town, I thought I would just post about Pisa as that is where we saw the most immediately "military" things. 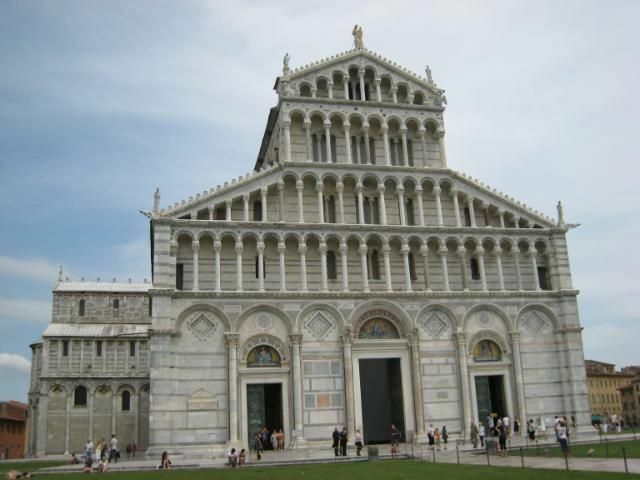 Pisa is not quite so appealing; it lacks the narrow cobbled streets and timelessness of Lucca. 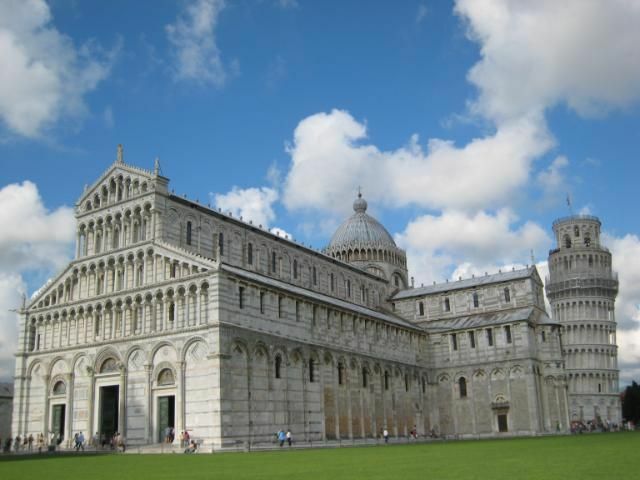 Above are two photos of the famous "campo dei miracoli", where the leaning tower stands alongside the main cathedral, baptistry and other buildings. The tower is a bit like the London Assembly building (otherwise known as "the testicle") - to fully appreciate the lean you have to view it from a particular angle. The reason why the tower, and to a much lesser extent the other buildings, leans is the soggy mix of sand and silt on which they were built. The tower's final form was completed around 1350. 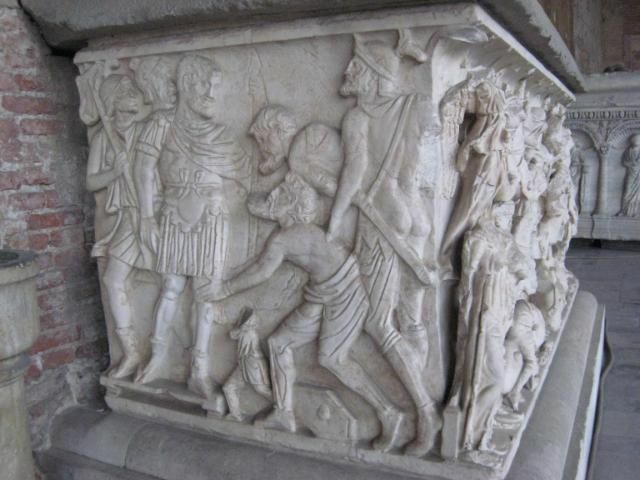 Below are scenes from one of the sarcophagi in the "Camposanto", another building in the campo which is essentially a cloistered cemetary. No dates seemed to be provided for any of the stone objects in this building, but the guidebooks refer to "late Roman" sarcophagi and that seems to fit the bill for this one and its Romans v barbarians relief work. 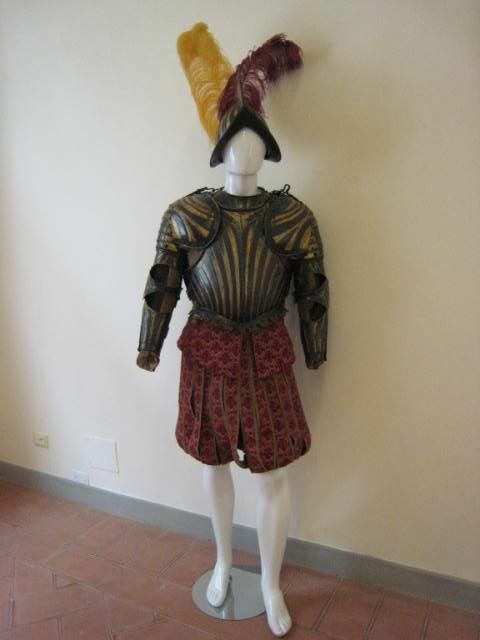 The campo's museums have some interesting things. 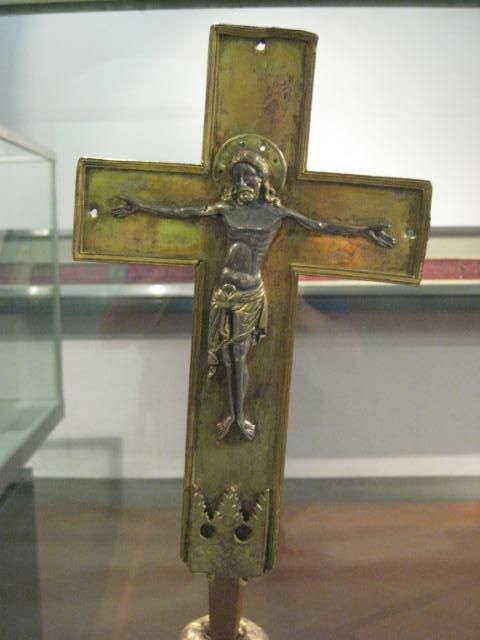 On the left is the "Pisa Cross", allegedly carried by the First Crusade's Pisan contingent. 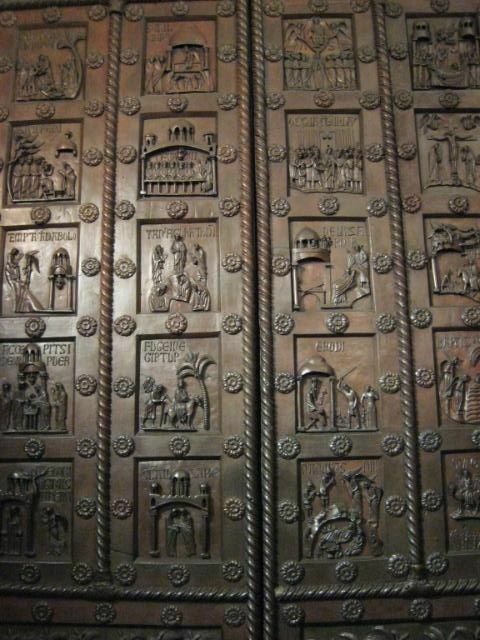 On the right are the cathedral's original bronze doors, made in 1180 and which depict the life of Christ in their various panels. 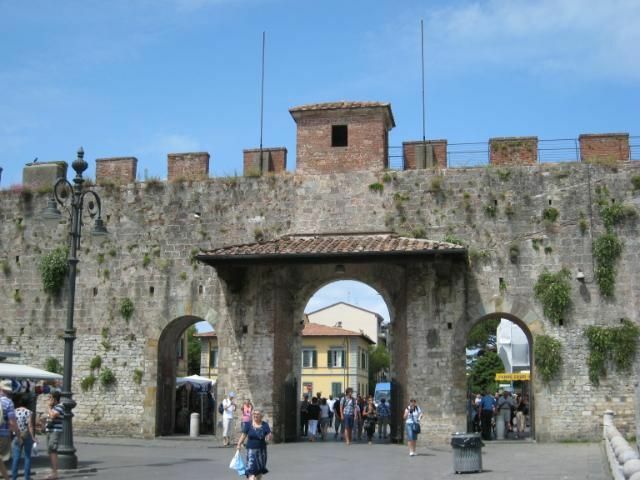 The city's walls date to the thirteenth century. 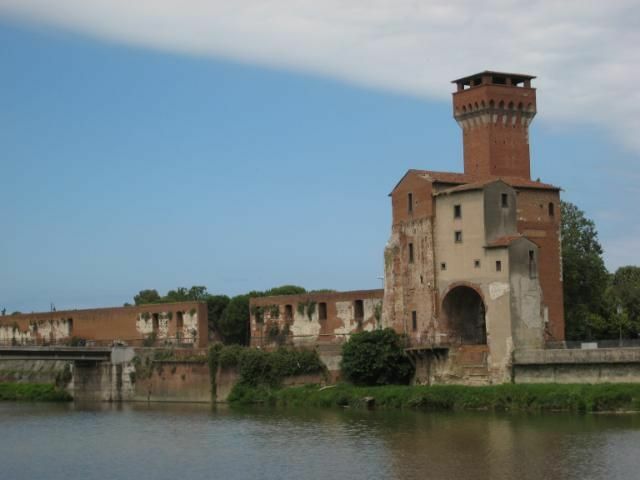 Below are a view of the Fortezza Vecchia, which used to guard Pisa's harbour (long silted up) and a section of wall with one of the gates. 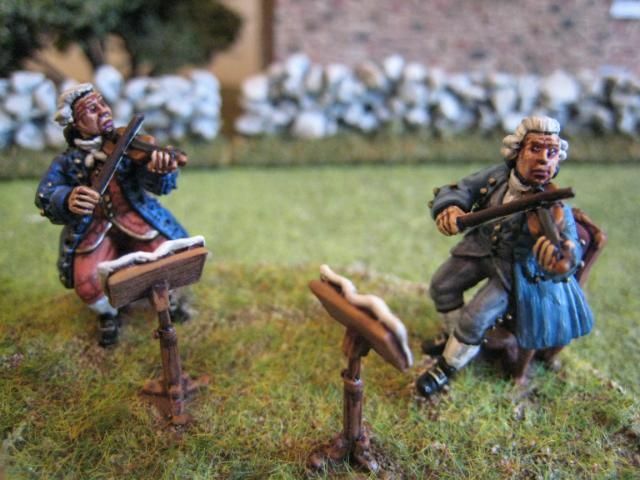 On the waragming front I have just finished Eureka Miniatures' 18th century musicians and have started work on my first full Carlist unit for the FCW. More Sudan is also in the pipeline. 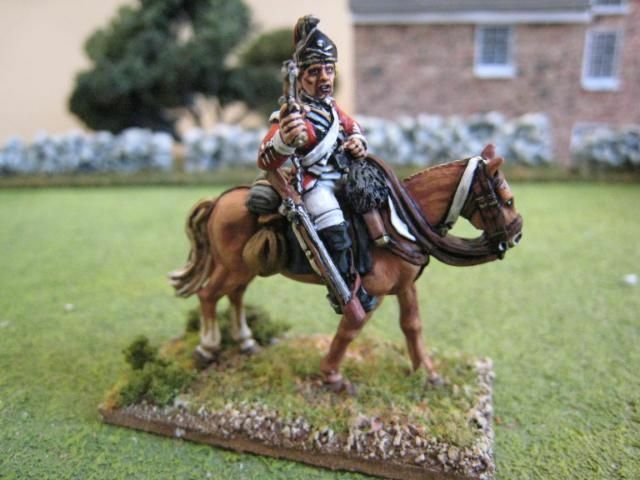 The 16th Light Dragoons was raised in 1759 by John Burgoyne (then a colonel). 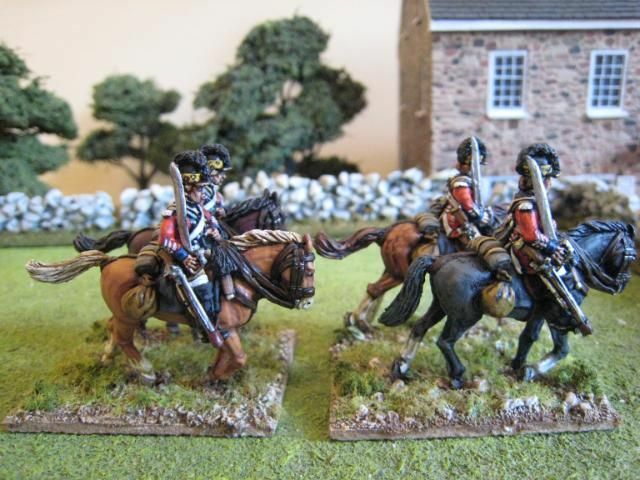 The regiment became a royal regiment in 1766 following its service against the Spanish. 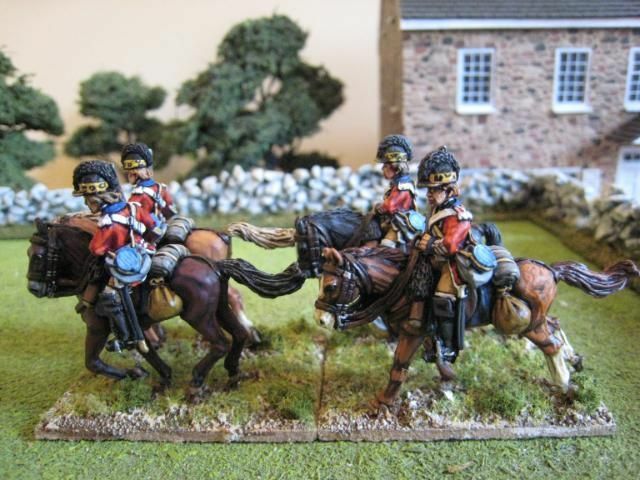 For a few years it was known as the Queen's Dragoons. The regiment was posted to Nova Scotia in October 1776 and immediately joined the main British army in New York. It fought throughout the New York and Philadelphia campaigns. 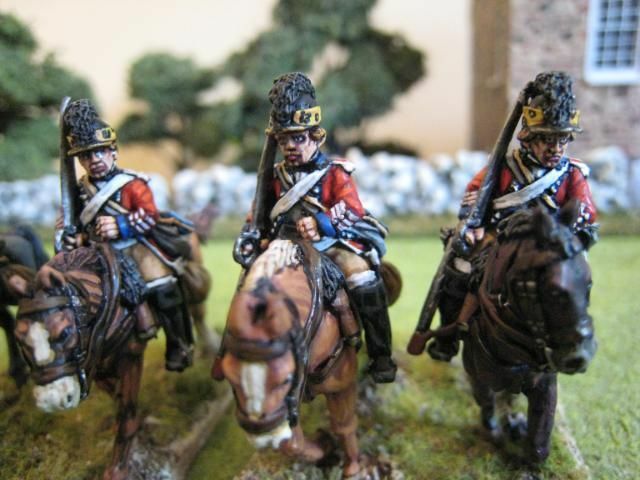 By 1778 the regiment was badly understrength and its men were transferred into the 17th Light Dragoons, the officers returning home. The regiment's modern day successor is the Queen's Royal Lancers. 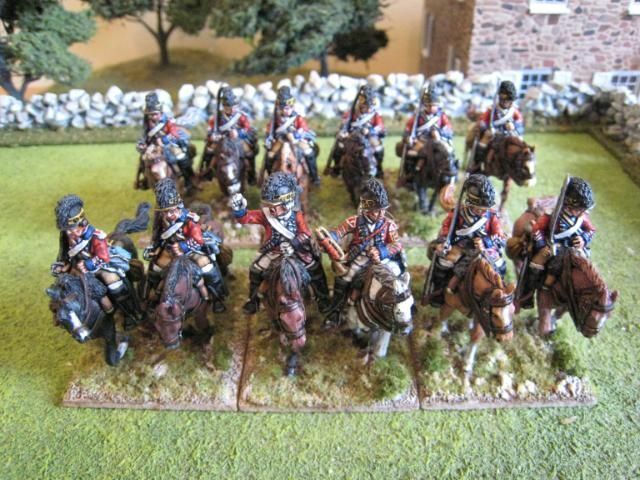 The 16th tends to appear en masse in the large northern theatre battles: Long Island (12 figures), Brandywine (14 - 6 in Knyphausen's sector and 8 in Cornwallis') and Monmouth (10). 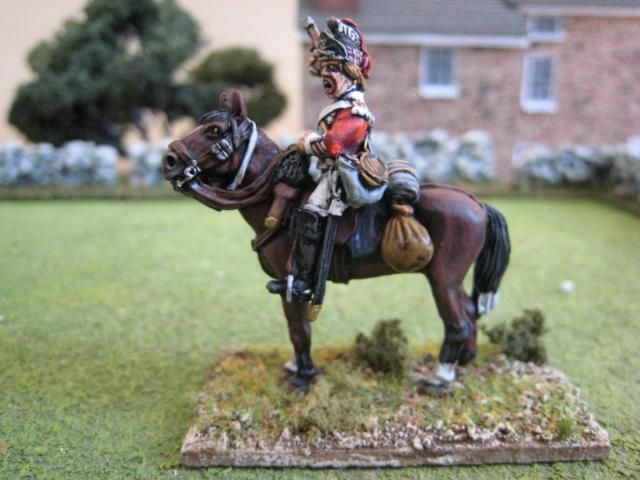 So the largest number of figure you need for the regiment is 14 for Brandywine, but in the event that I ever try to stage the whole of that battle myself I'll just add a couple of figures from the Perry skirmishing pack. Most of these figures were painted in 2005. They appear now because I have been meaning for ages to add another 3 figures to bring the total unit strength up to 12 and finally managed to do so last month. I had planned to paint these extra figures for the 2008 Long Island game, but I ran out of time. 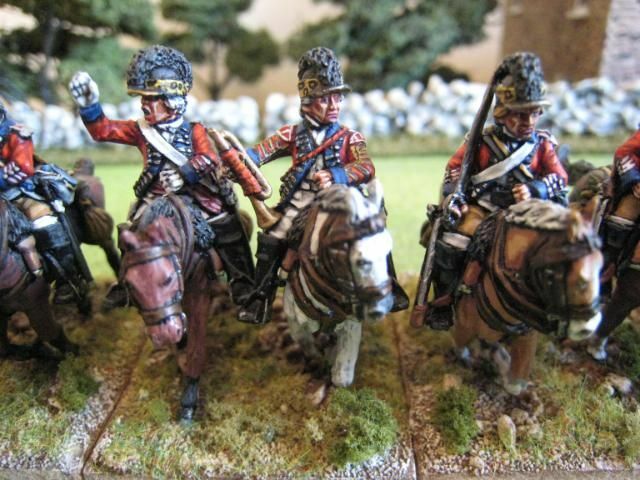 My painting style had developed substantially since 2005 and there is much in these figures that I would do differently now; principally the faces (which had a yucky GW flesh wash) and the horses (which are dry-brushed). That said, from "normal wargaming distance" it is probably difficult to spot the new figures and I think the unit gels together ok. In the pics below, the new figures are in the bottom row. The light blue colour on the water bottles is something I took from the Perry Miniatures website. 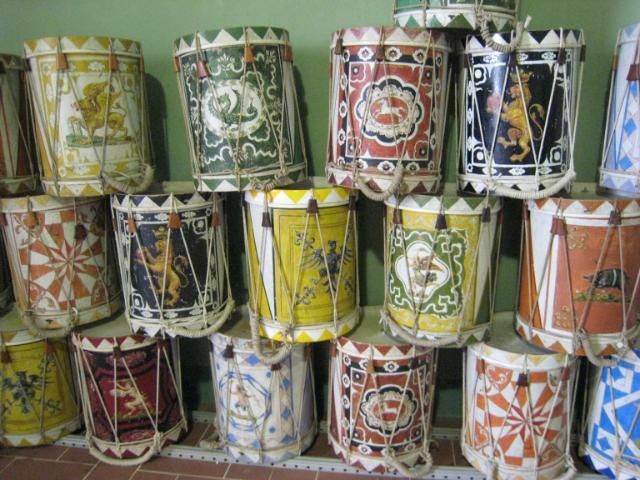 I have since been told that painting water canteens this colour was a Napoleonic practice and would not have been done at the time of the AWI - the canteens would mosy likely be of natural wood or covered with canvas to keep them cool. Another mistake on the Perry website is the dressing of the trumpeter in a coat with reversed colours. 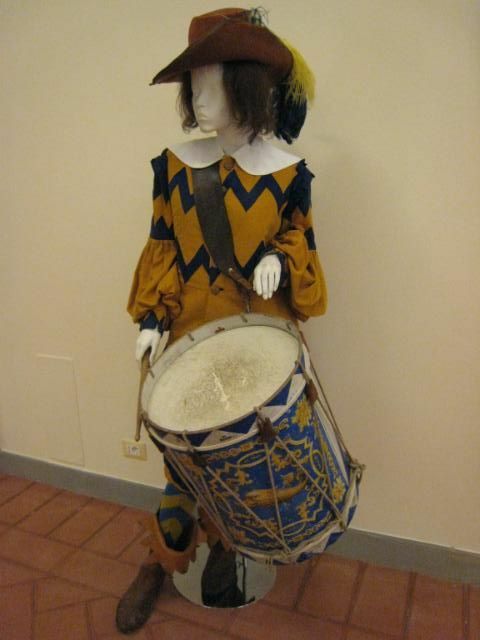 The 16th was a Royal regiment and so musicians' coats were not reversed in this way. 12 figures. Painted 2005 and May 2010. 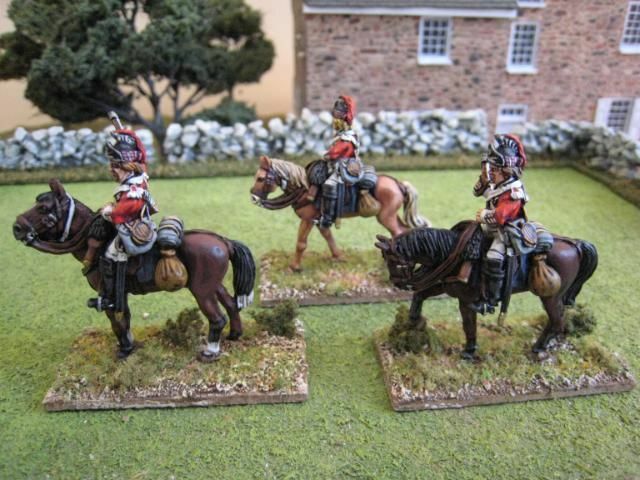 My second unit of figures for the 17th is the Perry pack of dragoons "on picket duty". These are lovely figures, although to be honest probably of limited use for the kind of large battles I'm interested in. 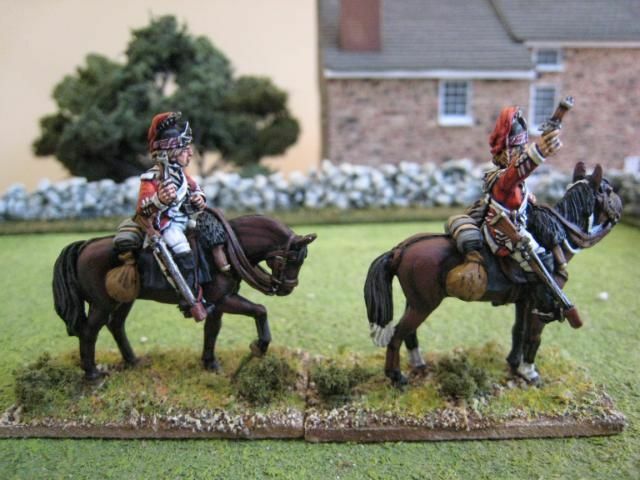 That said, I can see them patrolling the edges of the British lines, perhaps on duty in camp or even hovering around General Knyphausen who had a couple of dragoons attached to his staff (presumably as bodyguards or messengers). The figures' suitability for skirmish games is obvious and, to be honest,the figures are too nicely sculpted to be hidden away. 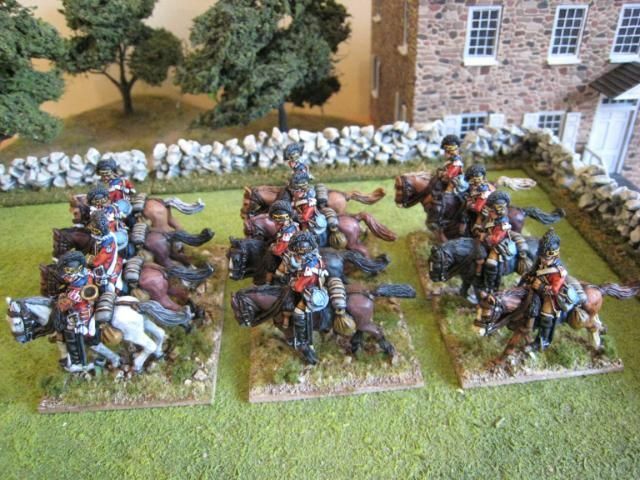 As these are "early war" troops I deliberately painted the horses in more traditional colours and not as palominos, tobianos or any of the more fanciful breeds that I enjoy doing. 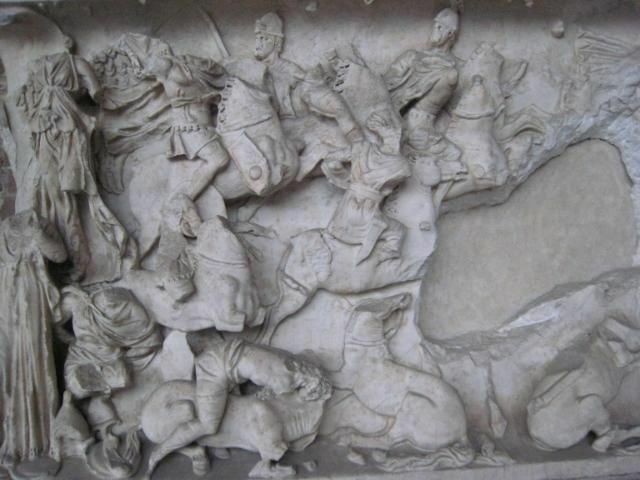 Paintings of dragoons in Mollo and on the Don Troiani website show the horses carrying white head bridles. 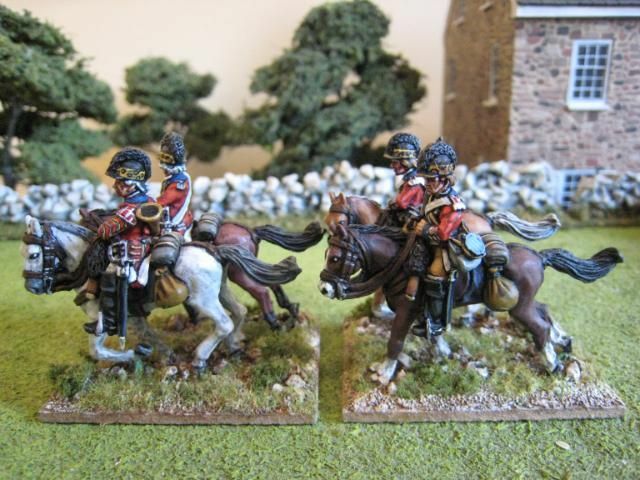 These bridles have quite clearly been sculpted on most (if not all) of the Perry Miniatures cavalry, but I hadn't noticed until now; consequently, I painted white harnesses where applicable. 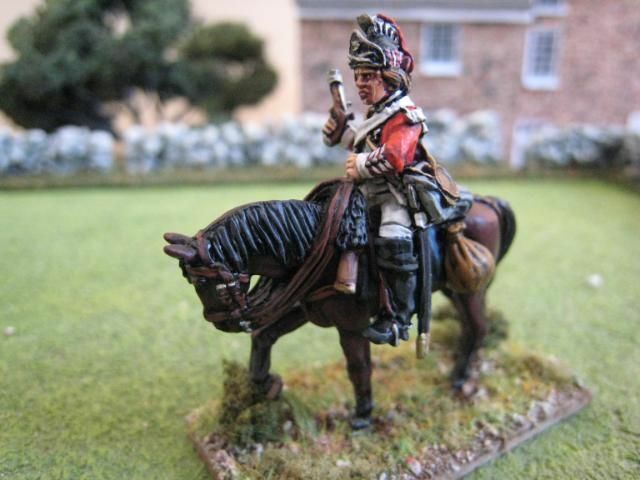 Veterans of the Foundry and Perry Miniatures AWI ranges will know that throughout the packs are various figures that have faces very similar to that of Alan Perry. 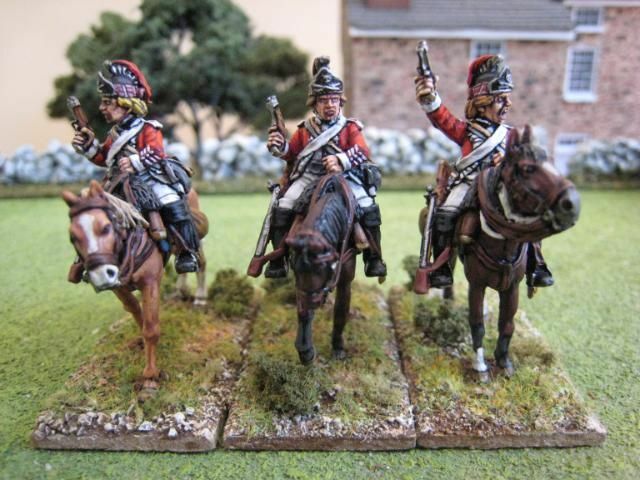 These figures are affectionately referred to by my London gaming companions as "Alans". A classic example can be seen in the close-up in the last pair below, although I would emphasise that I have never seen Alan looking so mean! 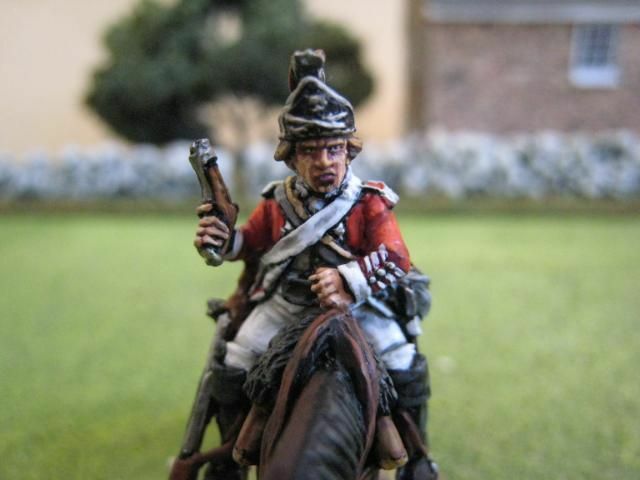 This is a face that appears in each of the rank-and-file cavalry packs in the Perry range. I'm quite pleased with the way this figure turned out - as someone said elsewhere, he looks as if he's going to shoot every rebel he comes across. 3 figures. Painted May 2010.